Many of you are likely aware that American actor, singer, dancer, comedian, and musician Danny Kaye was Jewish. But did you know he was a huge Israel supporter? As UNICEF’s First Celebrity Goodwill Ambassador, he came to Israel in the mid 50s. This resulted in Syria banning his movies. 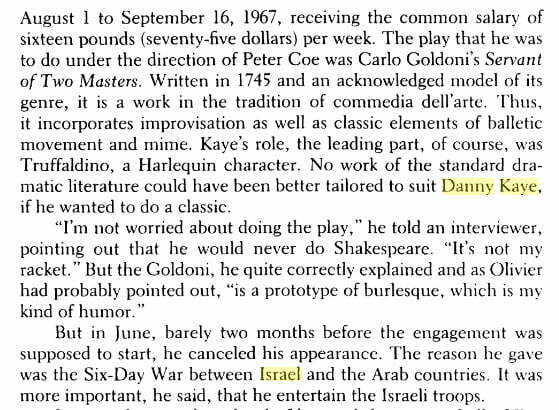 He later came in 1967 to entertain Israeli troops during the Six Day War. “Because I believe so deeply in the young I have offered my services. In recent months the youth of Israel have defended their young nation against an attempt at total annihilation. Their courage is on record for all to see. Nor can they now afford to relax. Israel must rebuild and reconstruct. And Israel must at the same time keep her door wide open to Jews from all over the world, especially those who come as refugees from persecution. The youth in Israel embodies all that Israel stands for—vitality, creativity, independence and the ability to turn to the things of the spirit. Many of the young Israelis are themselves refugee immigrants. To their credit they have turned away from the sorrows of the past. They are free of bitterness and face the future as it can only be faced by those young in heart and spirit. Do you recognize the man standing in the middle of this group of kids ? I went to meet my old friend (80) Yitzhak Ben Israel today, an old and wise friend of mind, living in Rehovot. The TV was on at his apartment and the movie on the screen was “The Ugly Duckling”, starring Danny Kaye. 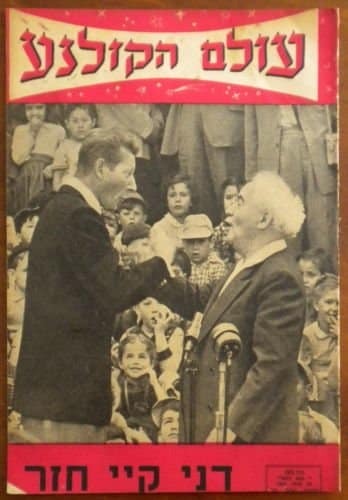 My old friend asked me: “Have I already told you about how I got to play the Accordion with Danny Kaye ? – Whennnn ????? Where ???? So my friend tells me: It was 1967, few months after the 6 days war. Me and some friends wanted to drive together to the Sea of Galilee. We took a car and drove to Tiberius where we saw a very long car line driving north. My friend stopped one of the drivers and asked where they are heading. The driver said there is a big show in Kibbutz Ein-Gev (on the other side of the lake). What big show ? – he asked. Danny Kaye, was the answer. We were all amazed. Imagine someone will tell you today that Elton John will make a show in a nearby community center. We immediately got into the car and joined the line, speechless. It appeared that Kaye, being an ambassador of UNICEF came to Israel to meet with Israeli kids after the war has ended. 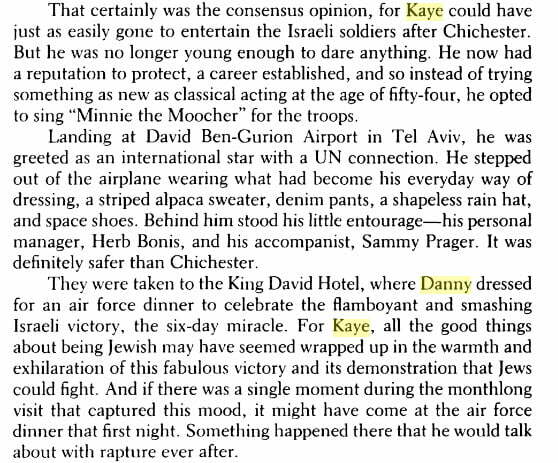 When we got to the Kibbutz we saw Danny Kay standing in the grass yard, surrounded by few dozen young kids and their teacher and went closer. Danny asked the kids if they wanted him to sing and they cheered up, but then he said that there is one problem and that is that he has no music to sing with. My friend ran to his car in no time, pulled out my Accordion and brought it with him. Then he dressed me up and pushed me forward. The funniest thing was that there was another accordionist there that the same thing happened to him, so within few minutes we were 2 accordionists there with Danny. Danny asked if I know how to play his songs and I said “Yes”. I really knew them all. 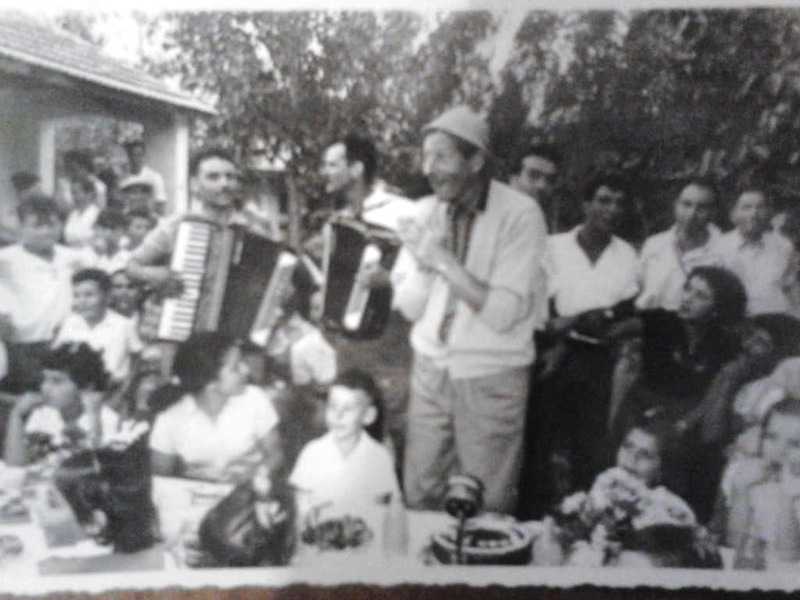 This is me in the picture between the young kids of Kibbutz Ein-Gev, looking at Danny Kay, playing the Accordion as he sings “The Ugly Duckly”. He also came to provide morale during the Yom Kippur war of 1973. October: Jewish artists from abroad volunteer their services for Israel’s war effort. 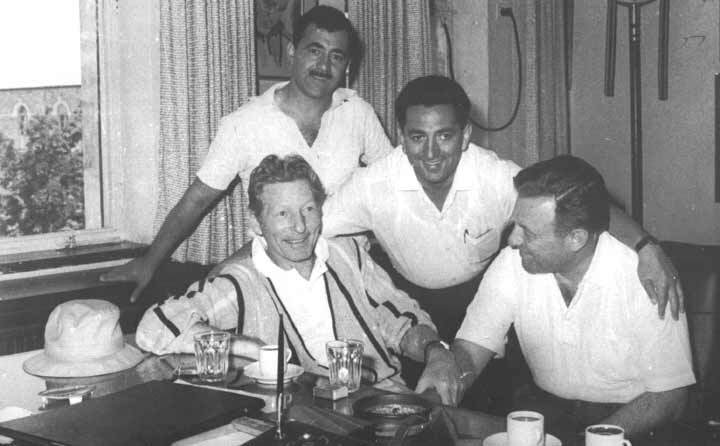 Danny Kaye arrives to entertain war-wounded soldiers, performing at the Mann Auditorium in Tel Aviv. They don’t make Hollywood celebrities like they used to. May Danny Kaye’s memory be a blessing.